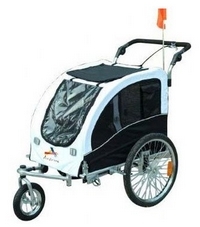 A dog bike trailer is an excellent accessory if you want to take your pet out. It allows you to carry your dog while cycling outdoors. You can allow your dog to keep fit while recovering from surgery or slowing down due to old age. 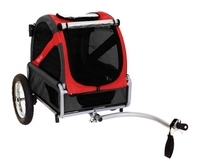 A dog bike trailer can also be used to haul light loads while carrying your furry friend. Dogs love rides especially if you can provide a comfortable means. All you need is to attach the dog trailer to your bike and allow you dog inside the trailer. Your dog will get inside willingly ready for the adventure. You can also remove the wheels and tower hitch the trailer for a pet crate. This comes in handy for home or vehicle use. 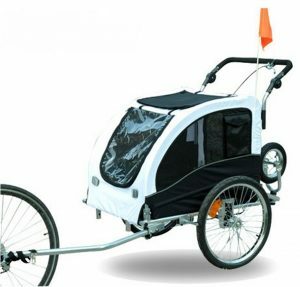 If you are a bicycle rider then the best dog trailer for a bike is something you should consider. Finding the top dog bike trailer might prove to be challenging. There are many different makes and models in the market. The two important things to consider are safety and comfort. You need to ensure that your dog is safe while in the bike trailer. The bike trailer should be accomplished with a leash tie for safety. It should include a tow bar safety strap, reflectors, rear lights and flag. These add safety both to the dog and yourself. Your dog should be comfortable during the bumpy ride. The pet carrier should ensure a smooth ride. 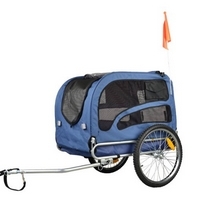 Consider the capacity of the dog trailer for bike and pet size. Whether you have a large or a small dog there is a right dog trailer for you. Check the measurements and make sure your dog will be able to fit inside. Internal pet cabinet dimensions is one of the most important factors to consider. This ensures that your dog fits in the area without being cramped. The right trailer size guarantees safety and comfort of your pet. It also increases the life of the bike trailer. All bike trailers have a recommended weight limit. Exceeding dog weight may cause the trailer to break. This can be dangerous for both you and your dog. The weight of the trailer is also another important thing to consider especially if you have a large dog. You should be able to tower both the dog and the trailers. Most pet trailers are made of aluminum frames and nylon covers. These add durability and strength to the trailer. Choose a dog trailer that can be folded for easy transportation and storage. This allows you to convert the trailer into a dog crate. This is very important if you consider driving while your bicycle stays parked. The best trailer also should be convertible into a stroller for walks along the park. Make sure the trailer keeps your pet warm during wet climates. The other things to consider is the ease of entry, divider protective cover, kickstand, ease of cleaning and assembly. This trailer is constructed with power coated steel frame. This allow the stroller to hold large dogs. The maximum capacity is 70 pounds. It measures 34 by 22.5 by 26 inches with a spacious interior. It features a waterproof polyester with anti-flip rubber floorboard. 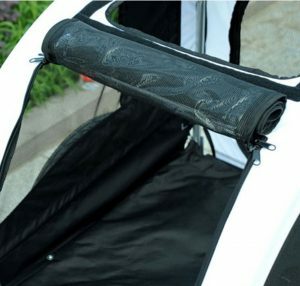 The zippered rear door allows your dog enter easily. The front window has a zippered mesh screen and vinyl layer that blocks the wind and adverse weather. This stroller can be assembled quickly with no tools. It can be folded flat for easy transportation and storage. The rear features a universal bike hitch. The 20 inch pneumatic tires allow the stroller to move smoothly on different terrains. Reflectors are included on both sides for safety in low light conditions. DoggyRide Mini is a little trailer perfect for cycling around your neighborhood with your small dog. The powered steel frame makes it very durable. It is constructed with resilient denier nylon and a sturdy sunlight resistant mesh on the front and the side panels. The front rain screen also keeps your dog away from adverse weather. The safety features incorporated are; tow bar arm, pouch on the rear entry door, bicycle hitch, safety flag and an interior leash set. DoggyRide Mini is recommended for dogs weighing up to 50 pounds and a height of up to 16 inches. The cabin measures 23 by 15 by 22 inches. This trailer folds by the fall of only one pin. It features quick release wheels for easy set up and disassembly. It can be converted into a stroller and a crate. This stroller is perfect for pets with arthritis. It is recommended to dogs up to 88 pounds. 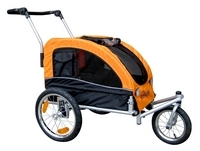 This to dog bike trailer includes a suspension that ensures a smooth ride. The front wheel can be fixed for jogging. It can also swivel 360 degrees to act as a stroller. The bar handle can be adjusted to suit different heights. The pocketed seats ensure pets safety. It features a 78 inch flag with a hole for it to slide in. Aosom Elite trailer features a suspension which helps in dumping the effects of a bumpy ride. It requires no extra tools for assembly and disassembly. Booyah connects to the axle and not the frame of the bike. The front wheel is removed for trailer uses. It is recommended for small and medium sized dogs up to 60 pounds. However, the interior dimensions of 26 by 18 and 18 inches allow a maximum weight of 30 pounds. The front window opens to allow your dog to stick their head out. A leash is incorporated to contain your pet. It also includes a pneumatic wheel, adjustable handlebar and quick release tires. These can be removed with the push of a button for easy transportation and storage. It also includes a wind, rain and 3 layer sun proof. The reflectors on the back also add more safety during low light conditions.